Born: 18 December 1816, Bridgnorth, Shropshire, United Kingdom. Died: 1 May 1897, Southsea, Hampshire, United Kingdom. 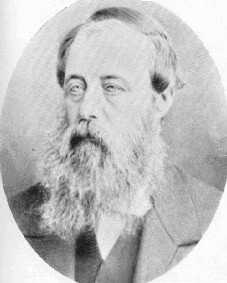 George F. Childe obtained the Bachelor of Arts (BA) degree at Christ Church College, Oxford, in 1838, with a first class in mathematics and physics. He received his Master of Arts (MA) degree at the same college in 1841. In the same year he was ordained as an Anglican priest and served as a chaplain at Christ Church College to 1846. As his main interest was in mathematics, he obtained an appointment as second assistant at the Royal Observatory, Cape of Good Hope, arriving for duty on 13 June 1846. One of his duties was to assist William Mann* in verifying the positions of southern stars, work which does not seem to have interested him much. After six years he resigned to become professor of mathematics and natural philosophy at the South African College, Cape Town, from 1 May 1852. He succeeded George R. Smalley*, who had also been an assistant at the Royal Observatory before becoming professor of mathematics at the College a year earlier. Childe was an able mathematician, perhaps the most accomplished at the Cape in his time. He produced three noteworthy publications during his first decade at the college. The first was a book, Investigations in the theory of reflected ray-surfaces, and their relation to plane reflected caustics ... (Cape Town, 1857). It was extensively reviewed in the Cape Monthly Magazine. He continued his study of the subject with a pamphlet, On related caustics of reflection, and the evolute of the lemniscata, as derived from a caustic of the hyperbola (Cape Town, 1859). This was followed by another book, Singular properties of the ellipsoid, and associated surfaces of the nth degree (Cambridge and Cape Town, 1861). In a later paper he dealt with "Related caustics: On a geometrical construction of the caustic curve, when parallel rays are incident in its own plane, upon any plane reflector" (Quaterly Journal of Mathematics, 1866). He seems to have been less effective as a lecturer, for example, F.C. Kolbe*, who attended his classes, recalled that he could be scathing to students. Furthermore, his teaching was seriously affected by ill health in later years. In June 1858 Childe was appointed by the governor as one of the commissioners (the others included T. Maclear*, M. Ruysch* and L. Marquard*) who were to ascertain and fix the size of the unit of land measure used in the Colony - a local version of the Rhynland foot. The only standards available for this purpose were two measuring rods of six Rhynland feet each that had been used by L.M. Thibault* and were later bought by Ruysch. By comparing these rods to British standards the commission found that the land unit was equivalent to 1.033 British Imperial feet (314.85mm) and renamed it the Cape foot. It remained in use as the South African unit of land measure until replaced by the metre in the nineteen-sixties. Also in June 1858 Childe was appointed on the newly established Board of Public Examiners in Literature and Science as an examiner in science, with Thomas Maclear and J.R. Innes*. He served in this capacity until the Board was dissolved in 1873. He was an excellent examiner and a conscientious administrator, and actively supported the creation of the University of the Cape of Good Hope - the first university in southern Africa, though an examining body only - in 1873. In September of that year he was appointed a member of the university's council and remained a member for six years. Childe's health and eyesight started to deteriorate in 1873. In 1874 he was given six months leave by the South African College, which was extended to the beginning of 1875, while A. Knox served as acting professor. He was in poor health in 1876 and later that year an assistant was appointed for him. He retired in October 1878 and returned to England in June the next year to settle on the Sussex coast. However, this did not spell the end of his academic life, for years later he published "On a direct relation between the definite elliptic integrals of the first and second order" in The Messenger of Mathematics (1890). He was remembered as a kindly and courteous gentleman. His two sons were early graduates of the University of the Cape of Good Hope and both had successful careers in medicine. Cape Monthly Magazine, 1858, Vol. 3(14), pp. 65-79: (review of Childe's book). Cape of Good Hope Almanac and Annual Register, 1856, p. 138; 1860, p. 130: South African College. Cape of Good Hope. Report of the Board of Public Examiners..., 1861-1873. Ritchie, W. The history of the South African College, 1829-1918 (2 vols.). Cape Town: T. Maskew Miller, 1918. South African College. Report for 1897, p. 1. University of the Cape of Good Hope. Calendar, 1875-1879.